About this guide . . . 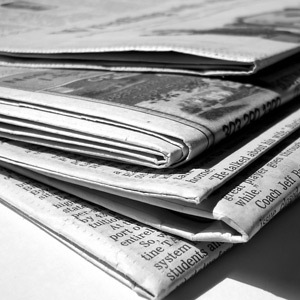 This guide is designed to help you find newspapers - regional, national, and international. Many of the online newspapers in this guide are restricted to UC San Diego faculty, staff, and students. Remote access to these resources, identified either by text or a blue lock symbol, requires connecting to the UC San Diego network. See the Library catalog for a full alphabetical or subject listing of newspapers to which the Library has access. Print copies of the most recent issues of major newspapers are available to read on the 2nd floor, West Wing of Geisel. Microfilm collections and readers are also located in this area. Get the top headlines for today's published papers. Select News Pages - Group Pages tab from the Factiva menu bar. Choose from Global Asia, Latin American Newspapers, New York Times, and UC Newstand (NYT, WSJ, WaPo). Choose Factiva Pages for WSJ, NYT, WaPo, LA Times, Chicago Trib, USA Today, Atlanta Journal Constitution, Tampa Bay Times, Barron's, and Forbes.